Janitorial supplies are essential for most businesses, and Rajapack has made ordering them easy. 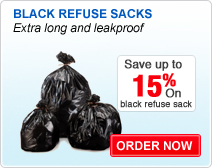 Stock up on janitorial products, with a range of essential warehouse supplies, including black refuse sacks and industrial wipes, as well as personal protective equipment like safety gloves. Whatever your business needs, you’re guaranteed to get the quality you want for a great price at Rajapack. And because we have experts in-house to help you choose, it’s easy to find the right products for your business. So whether you want paper hand towels for the rest rooms or personal protective equipment to use in the warehouse, give us a call to talk through your options.